For over twenty years, iXsystems has been the go-to company for storage and servers driven by Open Source, and we’re also the developers of FreeNAS®. With our unique convergence of hardware, software, and storage expertise, we bring you the award-winning TrueNAS flash-turbocharged enterprise-grade open storage platform, offering reliability and performance at a value unheard of in storage. TrueNAS unifies storage access, grows to nearly 10PB in a rack, is available in hybrid and all-flash configurations, has features that let you move away from the cloud saving over 70% over AWS, and uses the ZFS file system to guarantee data stays pristine and safe. One of the key pieces of technology we use in TrueNAS is the ZFS file system. TrueNAS integrates with all major backup vendors and virtual machine environments, and is certified with Veeam Backup and Replication, Citrix and VMware. It supports VMware snapshots, and has a vCenter plug-in. It is also integrated with Microsoft CSV, ODX, and VSS. ZFS is a future-proof 128-bit “scale up” file system that is designed for decades of continuous use. TrueNAS grows from hundreds of GBs to 10PB per system and is designed to make the increase in capacity painless. TrueNAS offers flexibility of choice, providing SMB, AFP, and NFS for file storage, iSCSI and Fibre Channel for block storage, and S3-compatible APIs for object storage. Every common operating system, hypervisor, and application is supported. TrueNAS uses OpenZFS to provide unlimited point-in-time snapshots, allowing you to roll back and access previous data versions. TrueNAS is a proven way to mitigate virtual machine corruption, user error, and ransomware attacks. The flash-turbocharged TrueNAS delivers a perfect balance of price and performance that puts many all-flash arrays to shame. It uses TrueCache™ to leverage RAM, flash storage, and spinning disks for flash-like performance with spinning-disk capacities and economics. 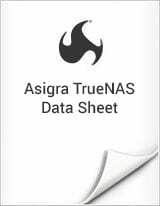 TrueNAS is the enterprise version of FreeNAS, the #1 software-defined storage operating system. With TrueNAS, iXsystems has delivered the enterprise-grade OpenZFS file system to more users than anyone. We pride ourselves on working closely with the Open Source community to help make OpenZFS the greatest filesystem ever written. Unified access of multiple files using various block, file, and object protocols. Reduction in the number of storage arrays required to support applications. The ability to build a private cloud instead of relying on expensive cloud storage services. As a true enterprise storage platform, TrueNAS delivers models that meet very demanding performance and capacity requirements. The top of the line TrueNAS M50 has up to four active 100GbE ports, 3TB of RAM, 32GB of NVDIMM write cache, and up to 15TB of NVMe flash read cache. Solid-state performance with spinning-disk capacity and cost—that’s what you get with a flash-turbocharged TrueNAS. There’s no question that TrueNAS is hands-down the best value in enterprise-class storage. TrueNAS provides unrivaled data integrity protection by using the OpenZFS enterprise filesystem. OpenZFS is a next-generation filesystem in every regard, from its self-healing bit rot mitigation to its flexible snapshotting and replication. Windows users can integrate TrueNAS with the Previous Versions tab within Windows Explorer. These features provide simple and efficient recovery points for physical and virtual business-critical applications. We have built our business on the quality of our service and support, and we want you to view our team as an extension of yours. iXsystems offers tiered support to meet any organization’s specific needs. We support your storage deployment so you don't end up having to scramble for costly services or additional hardware. In fact, customers say that the support they get with TrueNAS is first rate and they prefer our support to other vendors. With TrueNAS there are no long waits for filesystem checking at boot time. 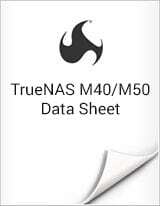 TrueNAS uses TrueCache™ to combine DRAM and non-volatile flash with high-density spinning disks to create a flash-turbocharged architecture. TrueCache uses algorithms to ensure data is stored on the fastest system storage media. By utilizing these algorithms in combination with flash-based read and write caching, performance speed increases by orders of magnitude at minimal cost. TrueNAS intelligently compresses what it can and skips over any data too inefficient to be worthwhile. Deduplication finds shared blocks between different applications or VMs. This storage optimization reduces the size of data written to storage media, increases performance, and gets the most out of every byte of storage. TrueNAS storage is designed for around-the-clock applications. When data grows, the expansion of TrueNAS storage is simple and non-disruptive.To upgrade any TrueNAS model to High Availability, simply add a second storage controller. High Availability ensures data is always available, meeting almost any storage requirement and lowering TCO to levels previously not thought possible with an enterprise storage array. With TrueNAS, downtime isn’t an option. We’re passionate about Open Source because we believe in the open flow of information and the innovation it fosters. We were the first to provide enterprise-grade storage based on Open Source. The Open Source development model allows us to release a more secure, stable, and feature-rich product more quickly than our competition. Open Source also provides us with direct access to a community of users and testers which provide feedback and feature requests, enhancing our speed of innovation. Open Source technology enables us to beat the competition on both features and price, which lets us deliver the highest value, lowest cost, and best return on investment for our clients. We develop FreeNAS, the Open Source version of TrueNAS. FreeNAS has been Open Source software since its inception in late 2005 and its 10M downloads make it the world's largest software-defined storage operating system. TrueNAS accelerates return on investment by providing better value over many other storage vendors. With TrueNAS, you don’t pay separately for features like snapshots/clones, unified protocols, and replication. If other features are needed in the future, you will not incur additional licensing costs. Performance Varies based on configuration. Contact us. * Compression rates vary by application. 2.5x compression factor for Hybrid Arrays and 5x for All-Flash Arrays is reflected in the effective capacity. The Case For TrueNAS® : Learn 6 Reasons Why TrueNAS is Replacing NetApp & EMC in the Data Center.